Precision Manufacturing... Design Engineering Expertise... Special Applications and Solutions. 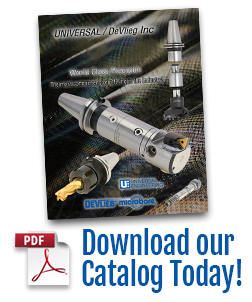 Welcome to Universal / DeVlieg…….Worldwide provider of globally recognized brand name tooling. Kwik-Switch automatic locking spindles and holders offer you faster tool change and constant locking force. Since locking force is always present, the nut continues to tighten under load. In fact, the rougher the cut, the tighter it gets. 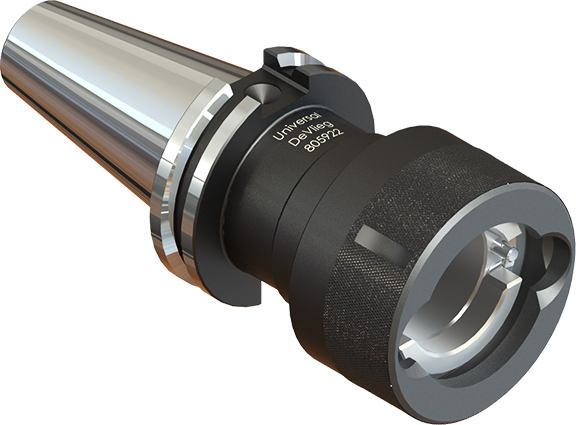 This ensures against losing or breaking the tool during the cut, adds to rigidity and accuracy, and saves time. By letting you change tools in 6 seconds vs. one minute, Kwik-Switch pays for itself. There are two ways to convert your machine to Kwik-Switch. One is to replace the spindle. Kwik-Switch Spindles are available as original equipment, or may be retrofitted on most machines. 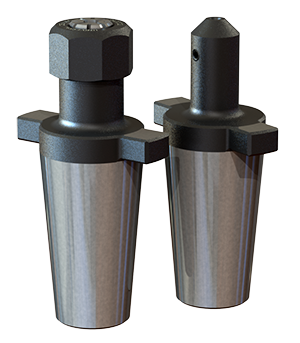 The second way is to adapt your existing machine spindle with a Kwik-Switch Master Holder. Kwik-Switch Master Holders are available to convert from R-8, CAT, NMTB, Pratt & Whitney Jig Borers, Morse taper, Jacobs taper, Brown & Sharpe and many more.